What's behind the largest increase in hate crimes since 2011? 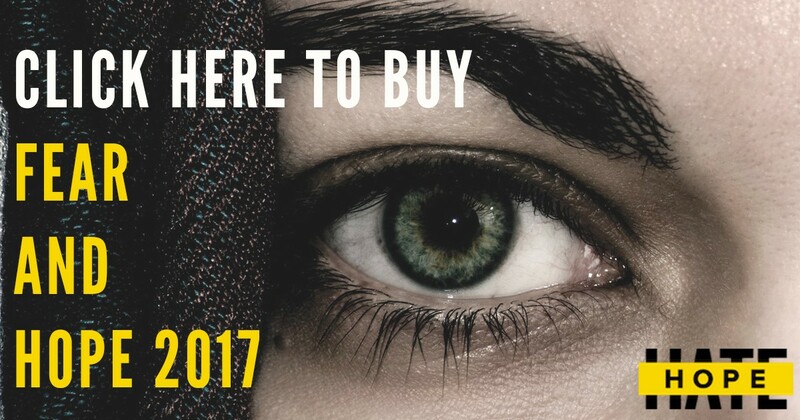 Official statistics released today by the Home Office show a surge of 29% in hate crimes in the past year, reporting a total of 80,393 incidents in the 12 months prior to March 2017. While the figures partly indicate improvements in reporting mechanisms, coming within a week of the government’s race audit they paint the picture of a country divided, where inequalities are at their extreme, becoming manifest through violence. However, this does not tell the full picture. Though an estimated 89% of attacks were motivated by race or religion and rates of police-recorded hate crime spiked immediately after the EU referendum, and the Westminster Bridge terrorist attack, our research indicates these events only impact the views and behaviours of a certain subset of society. Our Fear and HOPE report released earlier this year found a country that was increasingly polarised, as those on both ends of the identity spectrum hardened their views. While the liberal proportion of society has increased leaving a shrinking middle ground – which would seem positive news – the hostile ends of the spectrum have remained constant since 2011. Brexit and the recent terror attacks have mobilised these hostile groups, whose views have hardened. Islamophobia has increased, and among the most hostile identity ‘tribe’, seven out of 10 agreed that Islam was “a dangerous religion that incites violence”. There has been a small increase in the proportion of those who would support violence since 2011, concentrated in the most hostile tribes: around 20% of the English population would support a violent campaign to stop the building of a mosque, despite the decline in nationalist street movements over this period. 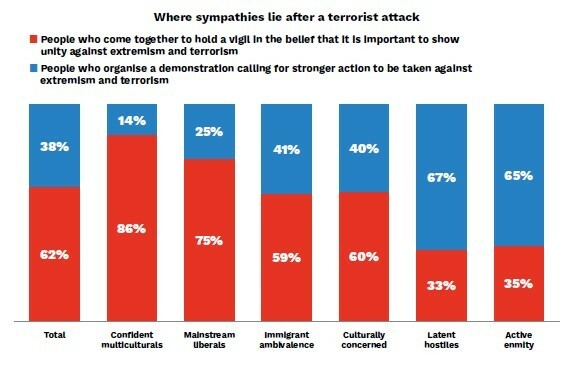 Our findings show that society is divided in where sympathies would lie after a terrorist attack. While the majority support coming together in unity, around 40% would support a demonstration calling for stronger action against extremism and terrorism. Shared fears can bring us together, but there is more to be done to ameliorate the response of those still willing to turn to violence or take to the streets in the face of hatred. Our survey also indicates that these hostile groups are likely to be further motivated towards aggressive responses. Brexit looks likely to cause economic downturn, causing greater insecurity and triggering increased fear and hostility towards others. Brexit may also trigger further rightwing discontent. Those who felt that Brexit would answer their anxieties about immigration and multiculturalism have become more apprehensive, with the realisation that it is unlikely to bring about any immediate changes. Leave voters have also indicated a high degree of anger in response to compromises on a Brexit deal. 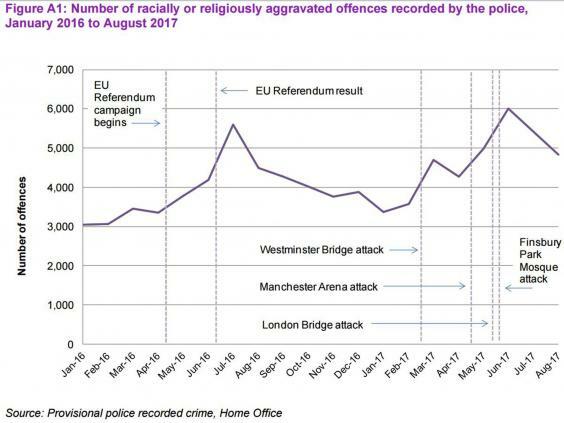 The figures released today are worrying, and represent just the tip of the iceberg, given that a high proportion of hate crimes go unrecorded. There is a great deal of work to be done to challenge violent hatred in our society – and we need to act fast.